I am so lucky to have Amara live close by so that I can be a part of the every day stuff. It is some of the best stuff ever. Jenna is still doing physical therapy for her shoulder from her fall and so the other day I went over to babysit Amara, who has been working really hard to learn to ride her bike. She is about 98% there. She has been practicing starting and stopping a lot, she’s got the riding part down! 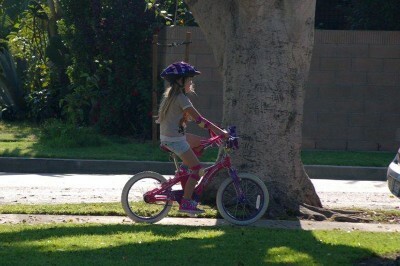 So while Mommy was gone she rode her bike around the block while I ran trying to keep up with her! I got a work out! The best part of our ride was when we got to the last corner. 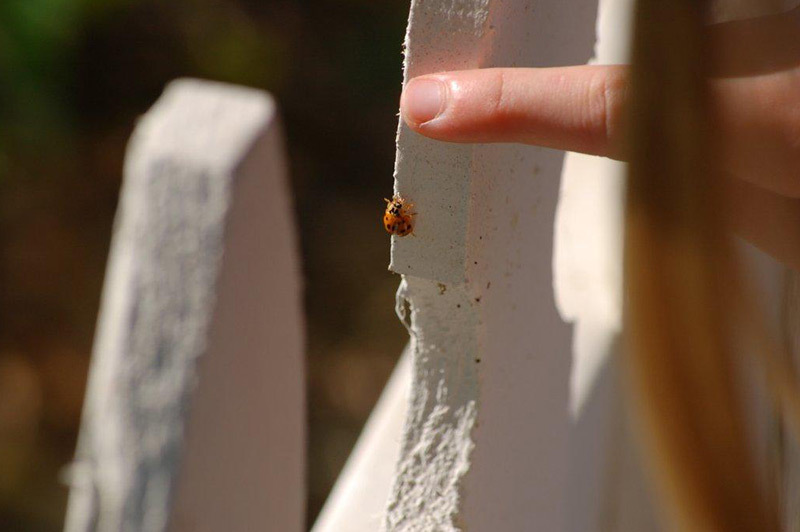 The people had just recently put in a really nice little white picket fence — and it was covered with ladybugs in various stages of life! I love ladybugs — I’ve mentioned before I had them on my wedding cake and these were amazing! We stopped riding for a while and watched them. There were larva (ugly), pupa, empty pupa shells and lots of ladybugs. We even found one bug that seemed to have just emerged from his pupa and was very wet looking and his shell was semi-transparent. We finally decided to finish our ride/run home but after getting lots of water we decided to walk back and see them some more. Watching these ladybugs was a wonderful experience made even better because the 2 of us shared it. Amara took her parents back later that day and most of them were gone. Her Mommy did get us a picture to remember the day by. 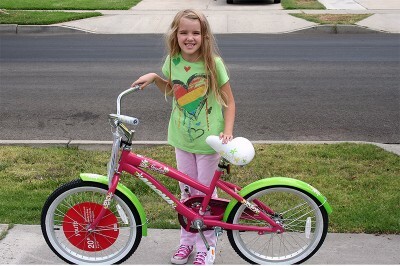 *UPDATE: This is an older post and the bike that came to live at our house when she got this new bike was recently replaced by this new bike! This memory was posted in Outdoors Fun and tagged babysitting, bike, ladybugs on July 16, 2011 by Grandma Kc. How sweet. I wish I could see the ladybugs. I could not have kept up with her at all! Good for you! Such love in your heart, Kc, when I read your writings about Amara. Everyone should love someone so much. It is wonderful!!! I love the new bicycle. Those green fenders are my favorite color. And what fun to find the ladybugs. They’re so beneficial for the neighborhood too. Wow, what will they come up with next — matching outfits and bikes. I love the image of you running alongside her. What fun. And to end the visit with ladybugs (and great photos) made it all the more memorable. Love the new bike! You BOTH are very lucky to have the other nearby. Isn’t it amazing the joy that nature can bring.When I’m with my grandkids they notice the smallest things and are fascinated by them. We adults could learn a lesson from them. Hi. I think lady bugs are lucky. Would love to see pictures of that wedding cake. What a lovely, serendipitous day. And, especially that ladybugs are already special to you, to be able to share that with your granddaughter! That must have been a wonderful experience! I have never sen Lady bugs other than adults I don’t think. Yes, sharing is best for everything 🙂 Thanks for sharing with us at SIS!